Get maximum of Rs. 8,400 Cash Back on HDFC Bank credit Cards on EMI option on purchase of iPhone. The offer is valid from 23rd February to 1st March, if purchased from Cloudtail seller. 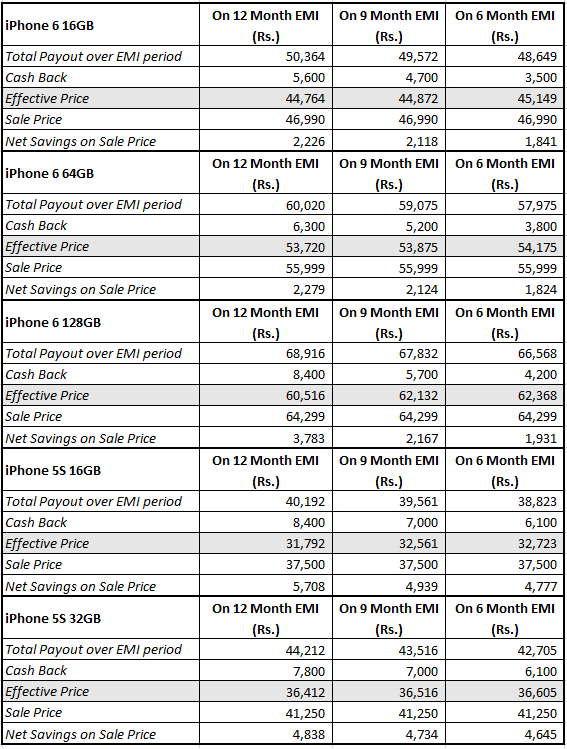 Below image gives more offer details for various iPhone models. 2) How can I avail this offer? There are no special steps to avail this offer. Just go through the normal purchase process. 3) When will I get the cash back? Cash back will be credited to the card holder's account latest by 1st June, 2015. 4) Do I need a promo code to avail the cash back offer? No, you do not need a promo code. Just use your HDFC Bank Credit Card on EMI to place the order. 5) Can I avail the cash back on more than one purchase? No. This is applicable on only one purchase per card. 6) What is the total cashback across tenures? The cashback is for all tenures, however, cashback amount varies by the one opted. For details refer to your specific model.